Blog ››› March 20, 2019 11:09 AM EDT ››› CRISTINA LóPEZ G.
In what seemed like an attempt to demonstrate the rise of the QAnon conspiracy theory movement within the right-wing establishment, Politico tweeted out a video about QAnon “true believers” filmed at the most recent Conservative Political Action Conference. Unfortunately, the outlet missed an opportunity to truly explain the oversized impact that weaponized misinformation can have over entire political movements by relying on two notorious far-right conspiracy theorists for their expertise. The 8chan-originated conspiracy theory that developed around anonymous posts signed by “Q,” an anonymous poster claiming to hold a high security clearance, holds that there is a behind-the-scenes scenario in which President Donald Trump is kneecapping a ring of powerful pedophiles connected to “the deep state.” The theory -- and the movement of followers it has inspired -- deserves media coverage and expert analysis to explain its influence on right-wing politics. 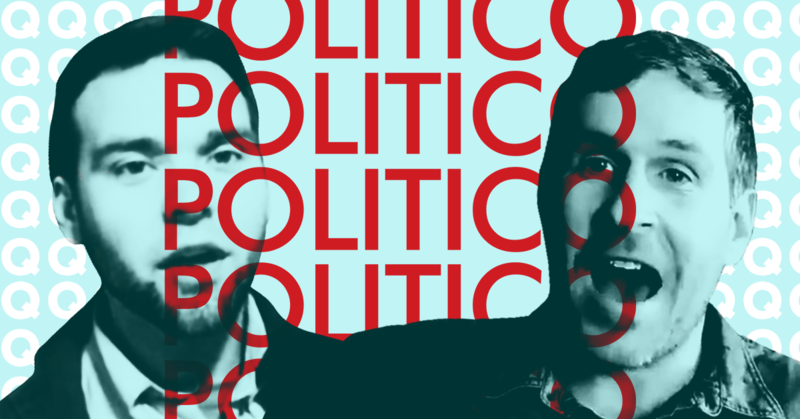 But Politico interviewed far-right conspiracy theorists Jack Posobiec and Mike Cernovich to make sense of QAnon, taking their opinions at face value, ignoring their own involvement in uncritically amplifying the conspiracy theory during its early stages, and downplaying their involvement in promoting the “Pizzagate” conspiracy theory by noting just that they have been criticized for pushing the theory, rather than stating what they did to promote it. Because Posobiec and Cernovich are grifters focused on sustaining their careers (which include publishing books and making films attacking the media), and they have recently made efforts to sanitize their public images and pivot away from the bigoted slurs, misogyny, conspiracy theories, and alliances with extremists that allowed them to grow their platforms during the rise of the MAGA internet. Politico’s decision to feature them talking about a conspiracy theory they played a role in creating -- without mentioning that connection to the audience -- helps them continue rebranding without any accountability. QAnon is misinformation being weaponized for political purposes, and it absolutely merits the attention and coverage of political media. But outlets can and must seek the expertise of real journalists and social media experts who understand the conspiratorial right without having been an unrepentant part of it. Don't just give a platform to two known grifters with long histories of weaponizing misinformation themselves.